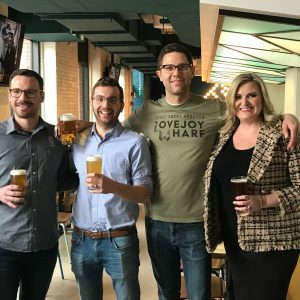 Night Shift is launching their new brewery and scratch kitchen location at Lovejoy Wharf on Wednesday, March 20, and we snagged a sneak peek. Sean and I had a chance to stop in on Thursday night and get a look at the new digs along with beer media / writers from the area. When we received the invite to visit we knew it was close to North Station, but until we arrived, we didn’t realize that the beautiful location is half a block from the North Station Green/Orange Line subway entrance and attached to the Converse building. The location was not built to replace the Everett production facility, but rather as a compliment to it. The bar is home to 30 draft lines and the 10 barrel brewhouse will be used as an innovation hub for the brewery. Visitors can expect Head Brewer Anna Jobe to release at least one new beer every week. Talking with Anna, she was excited to be able have the freedom to experiment on the smaller system. It’s not often that brewers are given free reign to brew whatever their brain is dreaming up at the time. Head Chef James Pearsons and Pastry Chef Lina Mondal have designed a menu that not only promotes fresh ingredients but also utilizes beer within the recipes. Lina Mondal also will be baking bread in-house for many of the offerings. Attached to the restaurant is the newly opened Night Shift roasting craft coffee bar. The founders started cultivating their love for craft coffee during the early days of the brewery when they began making drip over coffee with roasted beans available for purchase in the area. 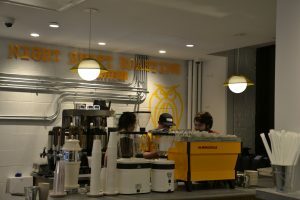 Night Shift Coffee Roasters will open at 6am and offer craft coffee and hand crafted breakfast sandwiches. 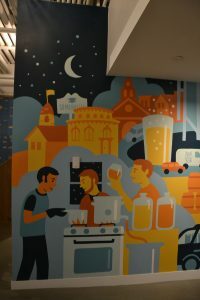 Murals on the walls show a brief history of the brewery including a depiction of founders Rob Burns, Mike O’Mara, and Michael Oxton homebrewing in a kitchen as well as images of their production facility and the Zakim Bridge as well. 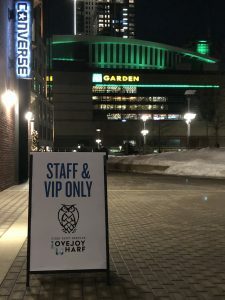 The founders want Night Shift Lovejoy Wharf to be family friendly. As a parent who has often adventured with his kids alone, it is AMAZING to see a restaurant, let alone a brewery, include a changing table accessible to men. I can’t wait to take my family there next time we go into Boston.